Download "Florida Bankruptcy Case Law Update"
6 final orders and judgments in a non-core proceeding only with the consent of all the parties. That consent may be provided expressly or through the parties failure to object. Because it was unclear whether the parties had consented expressly or through failure to object (there was confusion about the deadline to object to the court s authority to enter final orders and judgments in the proceeding), the court explained that, instead of filing the Proposed Order as a final order, the order was being filed as proposed findings of fact and conclusions of law under Rule 9033, Federal Rules of Bankruptcy Procedure. In re Brown 2014 WL (Bankr. M.D. Fla. Feb. 11, 2014) (McEwen, J.) Section/Rule/Keywords: 11 U.S.C. 105; , Fla. Stat. ; Claim Objection Summary: The Chapter 13 Debtor objected to a mortgage lien under the fiveyear statute of limitations provided in , Fla. Stat. The court concluded that the five-year statute of limitations under begins to run at the time the mortgagee exercises the right to accelerate. Here, the Court granted the objection because the lender had accelerated over five years prior to filing its action to foreclose, meaning the mortgage lien had expired as a matter of law. In re Rancourt 2013 WL (Bankr. M.D. Fla. Feb. 7, 2014) (Jennemann, J.) Section/Rule/Keywords: 11 U.S.C. 727; Discharge Objection Summary: Creditor objected to Chapter 7 Debtors discharge under 727(a)(2)(A), (a)(3), (a)(4), and (a)(5). 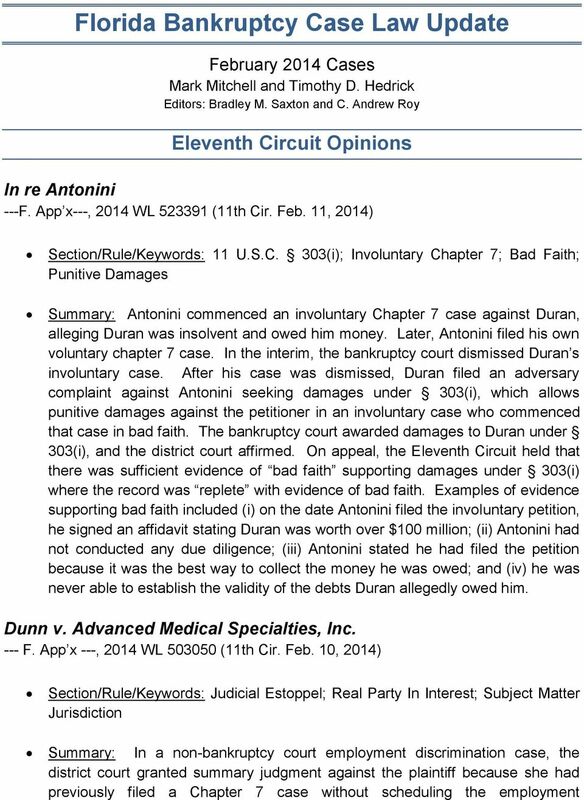 The bankruptcy court concluded that the creditor failed to meet his burden of proof. 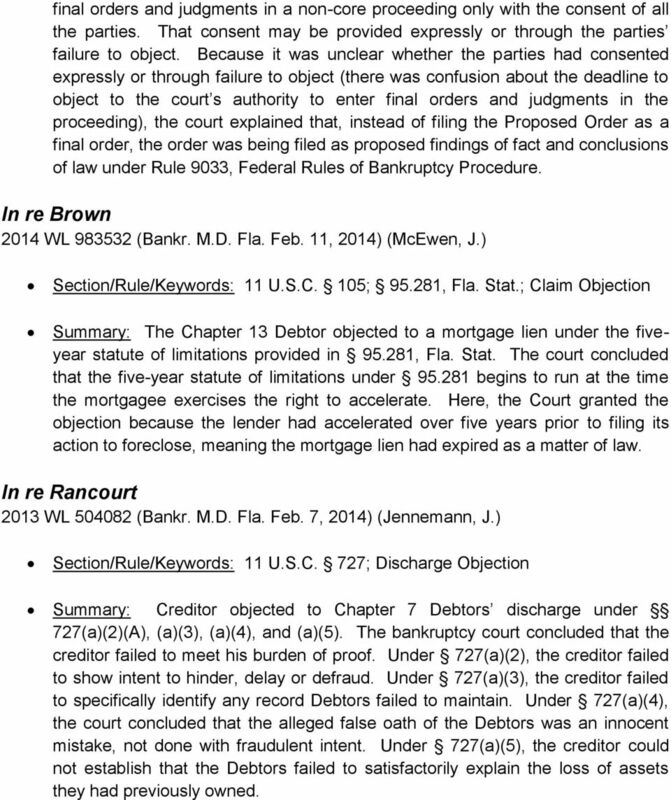 Under 727(a)(2), the creditor failed to show intent to hinder, delay or defraud. Under 727(a)(3), the creditor failed to specifically identify any record Debtors failed to maintain. Under 727(a)(4), the court concluded that the alleged false oath of the Debtors was an innocent mistake, not done with fraudulent intent. Under 727(a)(5), the creditor could not establish that the Debtors failed to satisfactorily explain the loss of assets they had previously owned. 7 In re Adams 2014 WL (Bankr. M.D. Fla. Feb. 4, 2014) (Delano, J.) Section/Rule/Keywords: 11 U.S.C. 1327(a), Res Judicata, Confirmation Order, Exemptions Summary: Two years after confirmation of their Chapter 13 plan, Debtors sought to amend their schedules to claim an exemption for property not previously claimed as exempt. The amendment would have resulted in a reduction of the amount Debtors were required to pay their unsecured creditors. 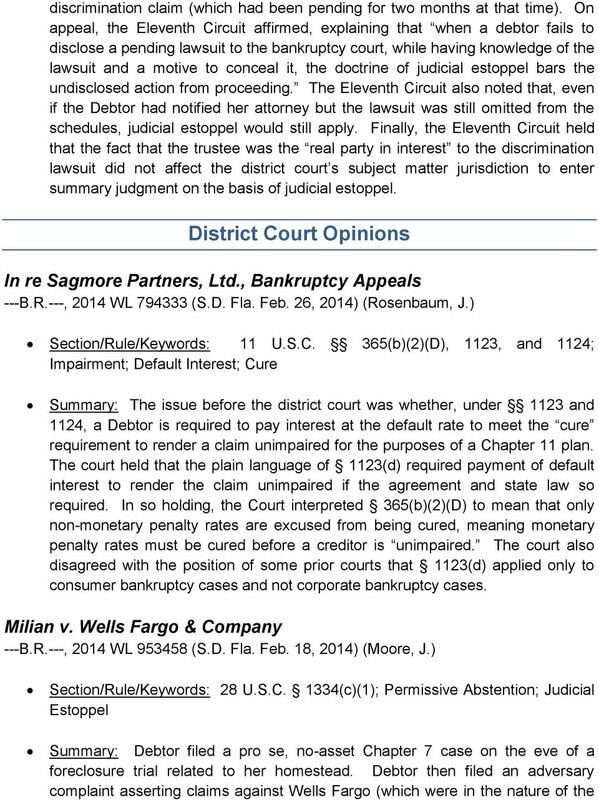 Court held the Debtors could not amend Schedule C post-confirmation because, under 1327(a), the provisions of a confirmed Chapter 13 plan are res judicata on debtors and creditors alike. In re Thoemke 2014 WL (Bankr. M.D. Fla. Feb. 4, 2014) (Delano, J.) Section/Rule/Keywords: 11 U.S.C. 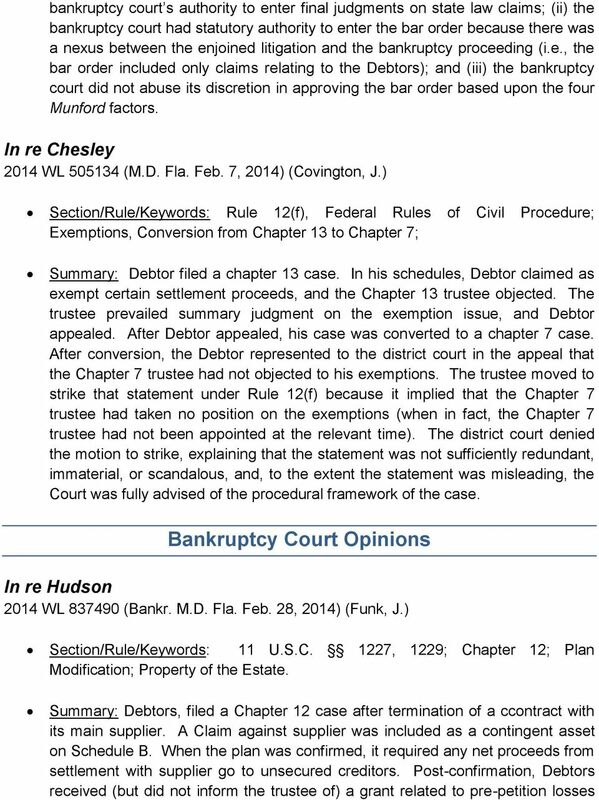 707(b), Dismissal, Conversion from Chapter 13, Means Test Summary: Debtors filed a Chapter 13 case. 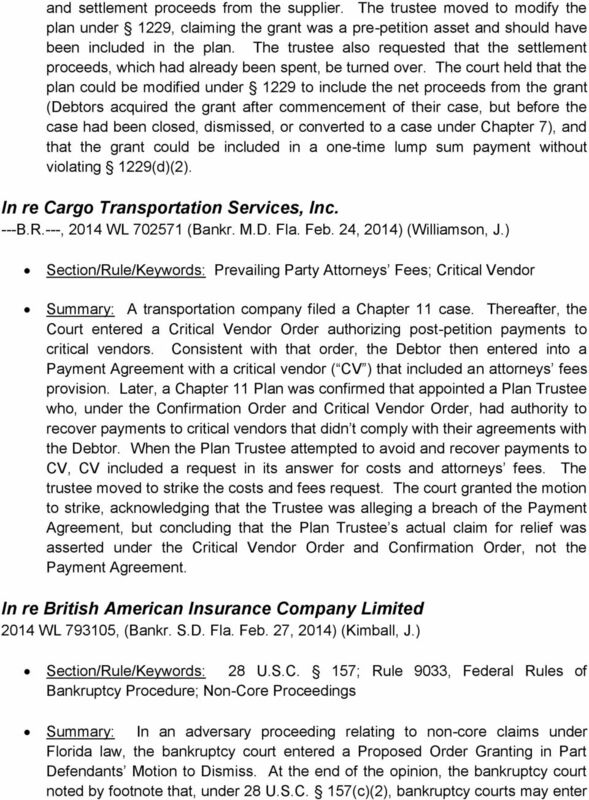 After the Debtors converted their case to Chapter 7, the U.S. Trustee moved to dismiss the case under 707(b). The court denied the U.S. Trustee s motion to dismiss, holding that 707(b) does not apply to a Chapter 7 case that was originally filed under Chapter 13. Acknowledging the split among bankruptcy courts nationally, the court was persuaded by reasoning set forth in In re Layton, 480 B.R. 392 (Bankr. M.D. Fla. 2012). The court explained that the common sense concerns of the contrary position are assuaged by other tools at the court s disposal, including its ability to dismiss cases under 105(a) and 707(a), and its inherent authority to sanction abusive litigation practices. UNITED STATES BANKRUPTCY COURT NORTHERN DISTRICT OF FLORIDA. JUNG BEA HAN and Case No. 00-42086 HYUNG SOOK HAN, v. Adv. No. IMPACT OF BANKRUPTCY ON DOMESTIC RELATIONS CASES. Honorable K. Rodney May United States Bankruptcy Judge Tampa, Florida. Case 6:14-bk-09462-CCJ Doc 48 Filed 07/20/15 Page 1 of 7 ORDERED. Dated: July 20, 2015 UNITED STATES BANKRUPTCY COURT MIDDLE DISTRICT OF FLORIDA ORLANDO DIVISION www.flmb.uscourts.gov In re: RICHARD S.
UNITED STATES BANKRUPTCY COURT EASTERN DISTRICT OF NEW YORK ----------------------------------------------------------X In re: Francisco Amaya and Case No. : 11-78239-ast Celia M. Amaya Chapter 7 Debtors. Case 2:06-cv-13665-MOB-VMM Document 9 Filed 03/02/2007 Page 1 of 9 UNITED STATES DISTRICT COURT EASTERN DISTRICT OF MICHIGAN SOUTHERN DIVISION In re: CARLA CRAIG-LIKELY, Debtor, / CARLA CRAIG-LIKELY, v.
RECENT CHANGES TO THE UNITED STATES BANKRUPTCY CODE WHAT CONSTRUCTION LAWYERS SHOULD KNOW AND THE POTENTIAL IMPACT SUCH CHANGES MAY HAVE ON CONSTRUCTION PROJECTS By John J. Lamoureux Carlton Fields, P.A. 2:11-cv-11896-BAF-RSW Doc # 44 Filed 10/30/12 Pg 1 of 10 Pg ID 486 ALESIA LOVE, UNITED STATES DISTRICT COURT EASTERN DISTRICT OF MICHIGAN SOUTHERN DIVISION Plaintiff, Civil Action No. 11-CV-11896 vs. HON. Pro Se Creditor s Handbook: Information for Persons Owed Money by an Individual or Entity that has Filed for Bankruptcy. Uncharted Waters: Navigating Governmental Entities Creditor s Rights in Bankruptcy Cases By Edmund S. Whitson, III 1 and Nicole C.
CIVIL PROCEDURE 101. Presentation by: Judge Emily Peacock, Scott Silverman, Esq. and Loren Beer, Esq. 11 U.S.C. 544 ORS 79.0109(1)(a) ORS 71.2010(37)(a) ORS 79.0102(pp) ORS 79.0102(iii) ORS 79.0109(4)(g) ORS 79.0309(2) ORS 79.0102(b) ORS 79. IN THE UNITED STATES COURT OF APPEALS FOR THE ELEVENTH CIRCUIT. No. 13-10558. D. C. Docket No. 8:11-bk-00369-MGW. 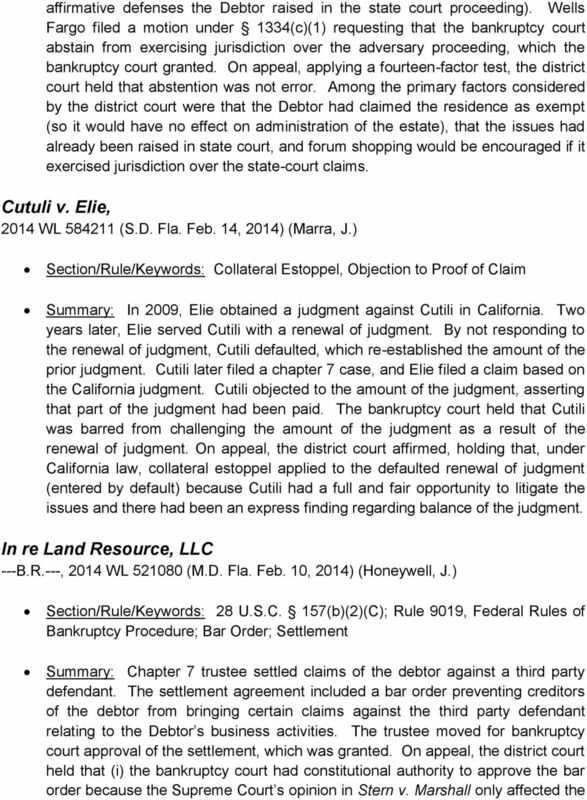 IN RE: TAHISIA L. SCANTLING, Debtor. UNITED STATES BANKRUPTCY COURT EASTERN DISTRICT OF NEW YORK ---------------------------------------------------------x Case No. ORDERED in the Southern District of Florida on July 25, 2012. UNITED STATES BANKRUPTCY COURT DISTRICT OF NEW JERSEY. 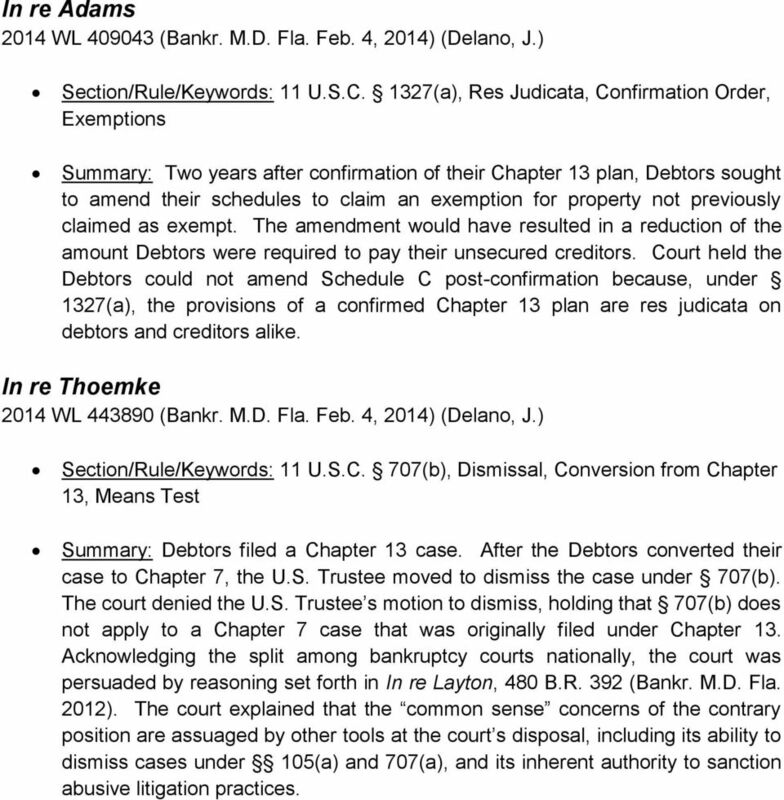 In re: : Bankruptcy Case No. 99-60663 : RICHARD D. HAWK, : Chapter 13 : Debtor.